Easyswitch-R® is a new generation of integrated point machine family for points and crossings multidrive. Easyswitch-R®is EN 50126 / EN50129 SIL4 certified. 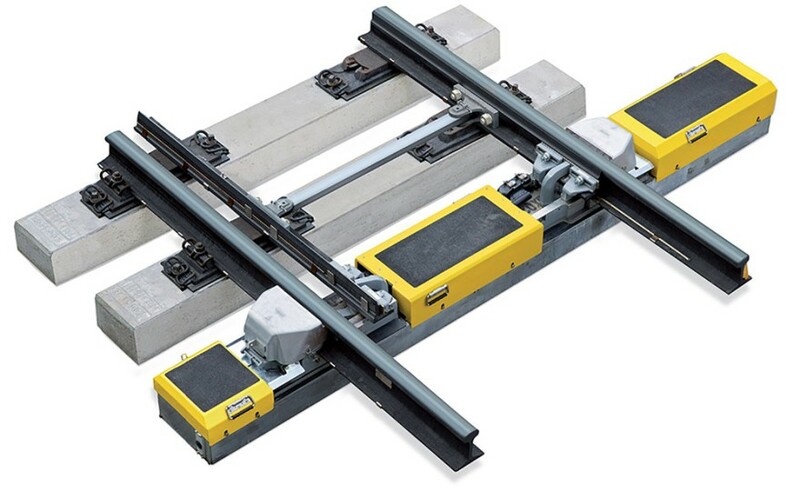 It includes in a conventionnal sleeper dimensions a complete set of modules to actuate, lock and detect position of points and crossings mobile parts (switch rail and swing nose). The Easyswitch-R® is the solution for conventional lines, for high-speed lines (over 250 km/h), heavy haul lines (30 tons per axle), metro and ballasted tramway lines. The point machine family is validated by the Swedish Transport Agency for railway applications which combined both passenger and fret traffics. The Easyswitch-R® is made up of "Plug and Play" modules easily and quickly interchangeable in track. The electro-hydraulic point machine withstands extreme environmental conditions of Polar Circle. The point machine operates both AC and DC powering. No activity is requested before points and crossings tamping machine operations.